Following a tweet alert â€œcan you recommend any vegan restaurants in Brightonâ€, Vegan in Brighton http://www.veganinbrighton.blogspot.com/ tweeted back that she was running a vegan cake sell to raise money for Sea Shepherd and the East Sussex Wildlife Rescue and Ambulance Service, so that was a must on our recent visit to Brighton. First off, we dropped in on The Manor, Gardner Street, http://www.themanorbrighton.co.uk/ for some breakfast and was delightfully surprised that they served soya milk, but no gluten free bread. Otherwise it was an enjoyable experience, chatting to the staff. Ray asked for bacon and a well cooked egg and it was perfect, while I opted for bacon and egg. Jojoâ€™s vegan cake sale was a great success with a mouth-watering array of cakes and pastries. When Ray asked whether they were dairy free, she proudly announced they all were â€“ so he was delighted! So what did we end up buying? It was a difficult choice, so we bought gluten free and dairy free banana bread (which weâ€™ve frozen), a dairy free cupcake and a delicious slice of gluten free and dairy free coffee cake with a creamy filling. The most unusual option was a courgette muffin, chewy and moist with a real courgette taste! JoJo runs Operation Icing, Brightonâ€™s not for profit vegan bakery http://www.operationicing.co.uk/The biggest discovery was the Wai Kika Moo Kaw cafÃ© 11a Kensington Gardens, Brighton, BN1 4AL - Tel: 0871 2071890, which Jojo recommended. We had walked past this restaurant on countless occasions, not realising it was vegan. Its menu usefully has symbols â€“ v for vegan, vo â€“ vegetarian option and gf â€“ gluten free. We met owner Faruk Bulut who explained how the restaurant started as a primarily vegetarian venue, but his wife Aga who is vegan, introduced vegan dishes. Special mention has to be given to the unusual but delectable drinks. Ray ordered the Breakfast Smoothie, consisting of banana, honey, wheat germ and soya milk at Â£3.75, while I opted for the Chai Shake, a mango and passion fruit smoothie (Â£3.75). For the main course, Ray chose the Kicking Kau Burger, a sweet potato and soyabean burger topped with homemade hummus and beetroot and horseradish salsa at Â£8.25. 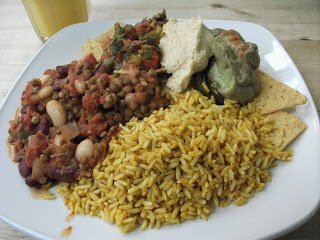 I had the gluten free, vegetarian Steaming Veggie Bean Chilli, served with aromatic rice, nachos topped with homemade salsa guacamole (Â£7.75). The menu boasts highly creative dishes such as Kicking Kau Curry with roast buttermilk, squash, courgettes, coconut and tomato or thereâ€™s the vegan and gluten free Risotto Rosso â€“ risotto with roast beetroot, sundried tomatoes, rocket and pesto (Â£6.95). If youâ€™re gluten free, check with the waiting staff that the dish is gluten free. Just because itâ€™s vegan, it isnâ€™t necessarily gluten free. We were too full for dessert, but thereâ€™s the Vegan Cake of the Say at Â£3.70. This must be one of the best kept secrets in Surbiton, Surrey. The menu advises you to speak to a member of staff if you are allergic or avoiding certain foods, so I immediately informed them that I was gluten free. I ordered the pork loin with bubble and squeak (Â£9.95), but was told that the sauce had wheat in it so I was offered two alternatives â€“ red wine sauce or rhubarb and stem ginger. Iâ€™ve always liked rhubarb so chose the second option, which complemented the pork beautifully. 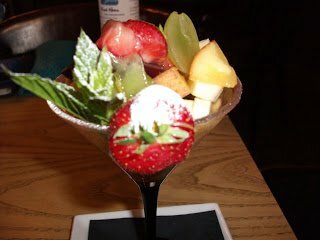 For dessert, I was reliably informed I could have Banana Pavlova (although there was cream in it, so no good for dairy free) or Fizzy Fruit Salad â€“ Cava over classic fruits which I enjoyed. Still water with lime cordial is a refreshing alternative to wine. Thank you Amanda for the suggestion. Read in the paper about all these alternative milks on the market â€“ wonder what camel milk tastes like?